GENUINE CALF SKIN LEATHER: 100% genuine cowhide leather with a lizard grain, ultra comfortable nubuck lining with polished solid stainless steel pin buckle. This watch band is designed with tone on tone stitching. 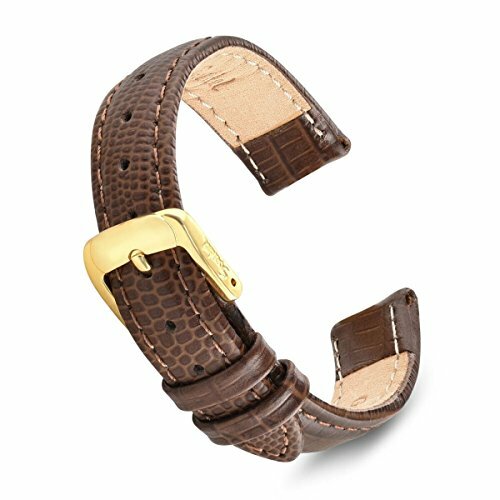 A VARIETY OF WIDTHS: Compatible with most traditional watches that uses 10mm, 12mm, 14mm, 18mm you can choose your correct size from our list. Measure the width where band meets the watch casing. You can easily find research online on how to measure the watch lug. TOTAL LENGTH: Total Length of our Regular is 6.8"-7.2"